Why do dwarves and duergar hate each other? How did the world come to have so many kinds of elves? What lies at the heart of the Blood War, the great cosmic struggle between demons and devils that threatens to destroy everything if either side were ever to emerge victorious? Mordenkaimen has all those answers and more - and now they can be yours, too. This tome is built on the writings of the renowned wizard from the world of Greyhawk, gathered over a lifetime of research and scholarship. In his travels to other worlds and other planes of existence, he has made many friends and has risked his life an equal number of times, to amass the knowledge contained herein. The first chapters present material for a Dungeon Master to add depth to a campaign that involves the characters in one or more of the ongoing conflicts described there. Options for players are provided as well, including new character races. 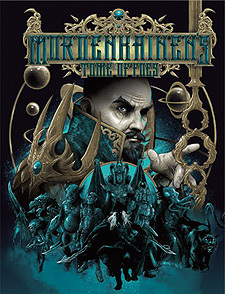 In addition to Mordenkainen's musings on the endless wars of the multiverse, the book contains game statistics for dozens of monsters, new demons and devils, several varieties of other creatures from throughout the planes of existence. For use with the fifth edition Player's Handbook, Monster Manual, and Dungeon Master's Guide.